For a unique Welsh experience, don't miss a visit to Cardiff Castle during your stay in the Welsh capital. 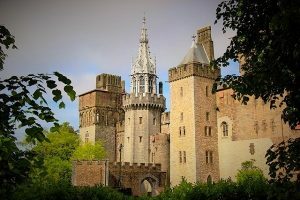 As one of Wales' most popular visitor attractions, Cardiff Castle is the centre-piece of the Welsh capital city, home to Roman and Norman heritage not to mention a gloriously opulent mock Tudor mansion. One of Wales’ most popular visitor attractions, Cardiff Castle is the centre-piece of the Welsh capital city, home to Roman and Norman heritage not to mention a gloriously opulent mock Tudor mansion. The settlement at Cardiff Castle dates back to the Romans who were first to inhabit the site and the outer walls of today’s castle still mark roughly the boundaries of the original Roman fort. In parts on the outer walls you can still see the original stonework whilst within the castle and the newly developed visitor centre there have been extensive excavation back to the Roman foundations. At the heart of the castle grounds and overlooking the extensive lawns rises the original moat and tower which date back to the 12th century. These were constructed by the Normans when the castle was used as a military stronghold against the local population. As needs changed, in the Tudor era a number of residential apartments were also added to the castle but the Castle’s history really comes alive as late as the 19th the century when the castle was acquired by the Marquis of Bute of Scotland. A successful coal baron in the thriving coal industry at the start of the industrial revolution, the marquis entirely revived the Tudor structures to create a lavish mansion. With the help of his wild imagination, extreme wealth for the times and the assistance of fashionable architect William Burges he transformed the castle adding an ornate clock tower and various spires and turrets. It was inside however that they excelled in their medieval gothic revival creating room after room of eccentrically themed and intricately decorated quarters; these include the summer smoking room elaborately decorated with jewels, the fairytale themed children’s nursery and the grandiose banqueting hall decorated with murals depicting the castle’s history. Today these quarters can only be visited on a guided tour which carries an extra fee but this is well worth it to see the unique interiors and hear the eccentric tales of the family and castle. 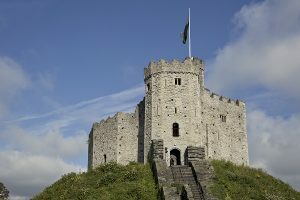 For a unique Welsh experience, don’t miss a visit to Cardiff Castle during your stay in the Welsh capital.